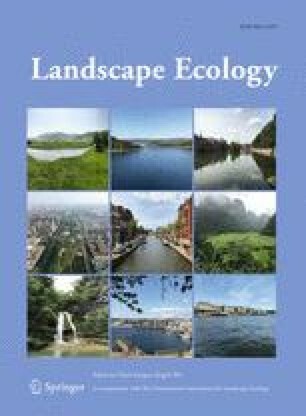 The distribution pattern of the tree frog (Hyla arborea) in an intensively used agricultural landscape in Zealand Flanders, was analyzed for effects of habitat fragmentation. The logistic regression models showed that the chance that a pond (potential reproduction site) was occupied by tree frogs depended on three isolation factors. The density of ponds within 750 m of the occupied pond was higher compared to ponds that remained unoccupied during the survey period. Additionally both the density of shrubs as well as the density of high herbs, two terrestrial habitat factors, was higher within 1000 m of occupied ponds. The explanatory value of two different types of isolation measures was compared with logistic regression analysis. It is discussed that ‘Concentric isolation measures’, which take size and distance of potential habitat patches in all directions into account, are expected to give a better description of isolation than the more often used 'distance from the nearest habitat patch'.